If you wish to improve your smile, but don't want a mouth full of metal, Invisalign orthodontics may be the treatment for you. Invisalign treatment uses orthodontic principles in conjunction with computer technology to improve your smile without using metal. Instead of brackets and wires, like traditional orthodontics, Invisalign uses a series of clear, removable trays to move your teeth into the ideal position. The clear aligners are designed on a computer to move your teeth in a step-wise fashion. Each aligner is worn for a two week period. The aligners can be removed for eating, brushing, and flossing. 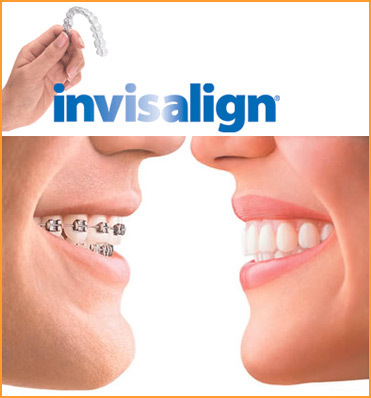 Invisalign orthodontic trays provide an esthetically pleasing way to move your teeth while allowing for you to maintain proper oral hygiene. Since the aligners are clear, they are virtually undetectable when worn. Also, because the aligners are removable, you can maintain better oral hygiene by brushing and flossing than with metal braces which make it hard to brush and floss the teeth properly.